Automatic recurring high or low patterns notifications: The app now identifies recurring highs or lows and notifies users via opt-in alerts on their smartphone so they can take action to avoid them in the future. There are five different messages, including: High pattern detected (1 week); Low pattern detected (1 week); High recurring pattern detected (over last 14 days); Low recurring pattern detected (last 14 days); and a Sync reminder. Goal setting and tracking : Allows users to set and track personalized goals for blood glucose tests, carbohydrates logging, and number of steps taken per day. Meaningful monitoring: New A1C comparator shows users their 90-day-average compared to the inputted lab A1c so they can see how their blood sugar has been over the time. 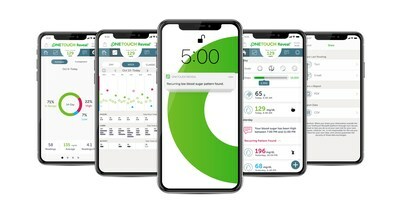 The OneTouch Reveal® mobile app seamlessly syncs with the OneTouch Verio Flex® blood glucose monitoring (BGM) system with built-in Bluetooth®i Smart Technology. Together, these tools help patients to understand their blood glucose numbers, take action to get back in range, and get on with life. With more than 1.3 million total downloads and 107 million plus blood glucose results logged, the OneTouch Reveal® mobile app is currently available as a free download for Apple® devices on the App Store® and Android™ devices on Google Play™ in 24 countries globally, including Argentina, Algeria, Austria, Belgium, Brazil, Canada, Columbia, Czech Republic, Chile, Croatia, France, Germany, India, Italy, Ireland, Mexico, Poland, Portugal, Qatar, Slovenia, Spain, the United Arab Emirates, the United Kingdom, and the United States. Another recent LifeScan innovation – the OneTouch Verio Reflect™ system with Blood Sugar Mentor™2 – received CE marking certification last week with commercial launch in France anticipated for early November and other EMEA markets following in 2019. In addition, the OneTouch Ultra Plus Reflect™ meter – a blood glucose meter with the same features as the OneTouch Verio Reflect™ meter that utilizes OneTouch Ultra Plus® test strips in place of the OneTouch Verio® test strips – is also awaiting CE marking with launch anticipated in Germany, Belgium and other EMEA markets in 2019. The OneTouch Verio Reflect™ system has also been submitted to the U.S. Food and Drug Administration (FDA) for 510(k) clearance, and to Health Canada for a Medical Device Licence. These new systems will also sync seamlessly with the OneTouch Reveal® mobile app, and they will unlock additional features in the OneTouch Reveal® mobile app, such as Blood Sugar Mentor™ messages, customization of device settings from the app, and synchronization of tagging. LifeScan, Inc. is a world leader in blood glucose monitoring – globally more than 20 million people depend on OneTouch® brand products to help them manage their diabetes, and the OneTouch Verio® platform has demonstrated seven years of proven accuracy across more than 70,000 clinical data points3. In the U.S. LifeScan, Inc. is the leading blood glucose monitoring company and OneTouch® brand products are recommended by more endocrinologists, primary care physicians, and pharmacists than any other brand. For more information, visit: www.OneTouch.com.